COMMENTS: The mold is simple to use and releases the soap easily. I love the size of these little soaps, perfect size for my child. COMMENTS: I use these for my lotion bars. They fit perfectly in palm of hand. Great guest size soap too! 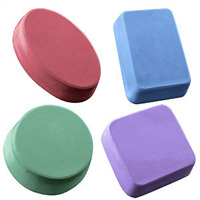 COMMENTS: I use this to make my "candy"soaps.This is a fun mold 4 small soaps. COMMENTS: This is the first time I've tried making soaps. Could not be easier and the little soaps are adorable.